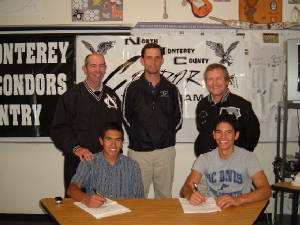 Nate and Keli sign to Cal Poly & UC Davis! Scroll down and check out who has taken it to the next level and is making us proud back in Condor Country! ANYONE can run in college! JUST DO IT!!!!!!! 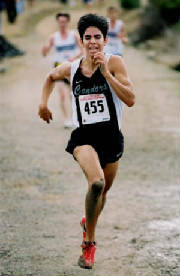 9/24/05 Keli runs 26:10 for 8k at Stanford! 10/1/05 Keli is 8th man and places 78th in big meet in Oregon. Team 5th. Broke the school cross country record for Hartnell at Toro Park on 10/7/05! 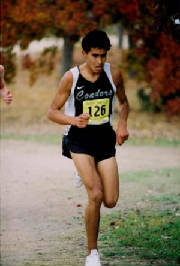 9/10/05 Jose places 6th in major Fresno Invite running 21:27 for 4 miles! 9/29/05 Jose places 5th in 20:43 at Lou Vasquez Invite and leads team to 2nd place! 10/7/05 Jose runs 20:33 for 4 miles!! That breaks the Hartnell College school record and he guides his team to a 1 point win! WOW! 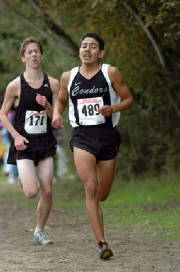 10/15/05 Jose is 2nd at Crystal Springs Invite and leads Hartnell over State Champs Orange Coast! 10/26/05 Herald higlights Jose & Grecia as Conference Champs! 9/29/05 Mike is 7th man at Lou Vasquez and team places 2nd! 10/7/05 Mike runs 22:35 and Hartnell wins! 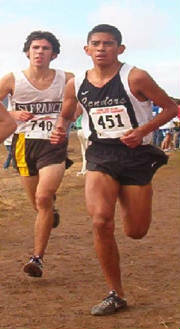 10/15/05 Mike is 63rd at Crystal Springs Invite and leads Hartnell over State Champs Orange Coast!